Every buyer goes through a “honeymoon” period when their monthly bond repayment seems a small price to pay for the pleasures of home ownership. But the romance can sour rapidly if that instalment becomes a burden - which can happen quite easily if your work hours get cut back, you really have to buy a new car or an addition to the family puts new demands on your household budget. The signs that affordability is becoming a problem include making your bond repayment later and later each month, cutting back the repayment of other debts so you can afford the bond repayment, or perhaps even “borrowing” from your credit card or overdraft facility to make up a shortfall on the instalment. If this is your situation, he says, your first step is to work out how long your cash “crunch” is likely to last. An interest rate decrease may be on the way, or you may soon be due for a salary increase. Perhaps you’ll be able to ease the situation quite quickly by cutting family spending, by taking a part-time second job to pay off your short-term debts, or even by getting a new, better paid, full-time job. The second step is to stay calm, even if it looks as though you’ll be in a bind for quite some time. Take charge and ask your lender about options for lowering your monthly home loan repayment. You may be able to extend the term of the loan, for example, or “cap” it for a while and only pay interest until your financial circumstances improve. If you have owned your home for quite some time and have good equity, you may even be able to refinance the loan at a lower interest rate. Thirdly, says Botha, you may decide that you really can’t manage the bond repayments at this stage and should rather sell your home, pay off your debts and start over. Whatever you do, he notes, you should not just stop paying your instalments and wait to see what happens. “The last thing the bank wants to do is repossess your home, but once the letters of demand start coming, it will be difficult to convince anyone that you are taking your obligations seriously and that any plan you have for making up the late payments is actually workable. “And if you let your home be repossessed, you will lose whatever equity you have built up in the property and your credit record will be ruined for years. What is more, if the property is then sold at auction for less than you owe the bank, you will still be liable for the difference. 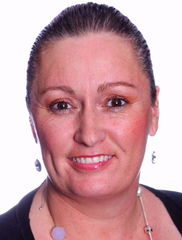 Anne-Marie Bamber is Norgarb Properties dedicated Home Loans Consultant. She has over 15 years’ experience in assisting clients with their Home Loan needs and has placed many happy families in their dream homes. Contact her today for no cost stress-free home-buying.